Inspired by the handcrafted vessels in Budapest's top luxury hotels, this adjustable 3-light cream beaded pendant lamp radiates Bohemian-chic style. 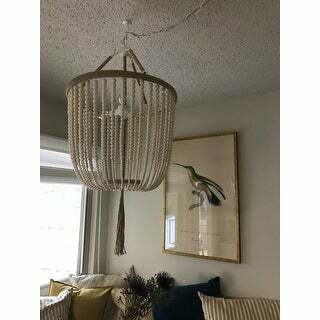 This pendant's posh strands create informal elegance, and the design is an ideal choice for any contemporary or transitional decor. I just installed this in my daughters bedroom the other day. The dimensions are misleading, it is actually 35 1/2 inches tall. At first I was unsure about the large size, but once the room was completed it actually looks perfect. The beads are a beautiful ivory color, not brown at all. Maybe the other reviewer was expecting white? Absolutely love it! Good quality and easy to install! Adds so much character to my kitchen eat in area! 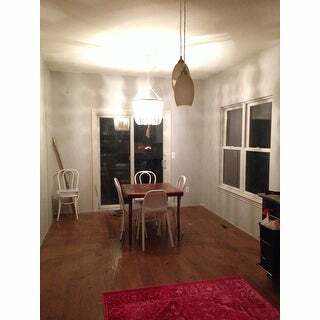 I plan to order more for other rooms of my house that’s how much I love it! Find me on Instagram at embellished dwelling for affordable decor pics! Looks great. Really adds a nice element to the nursery I put it in. Can't just count on the light from this light fixture. You need other sources. I have installed light fixtures in the past. make sure you follow the instructions for pulling through the electrical cords at the top, otherwise you will have to redo it like I did. 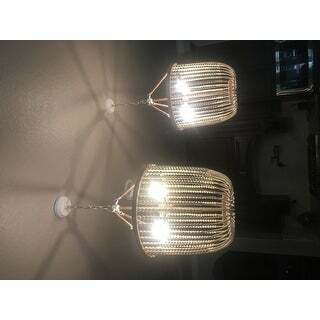 This is one beautiful light and adds so much character to our dining nook! However, it looked kind of long as is. I used clear fishing nylon to raise the bottom loop up a few inches and now it is perfect! I would recommend this light fixture. Its beautiful! A statement piece! A steal for the price! What a beautiful pendant! I'm in love with it!! Love it! 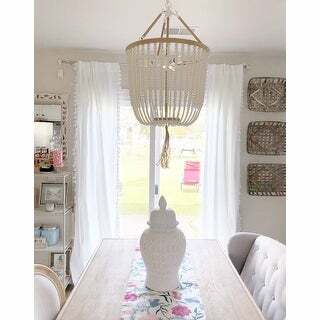 This chandelier really updated the look of my dining room for minimal cost. I was able to install it myself without a problem. I was a little worried that the acrylic beads would look cheap compared to a wooden bead, but I'm so glad i took the chance-- they are a nice weight and a clean look. I ended up not using the bulbs that came with it as they didn't seem to be compatible with my dimmer switch (our house was built in the 1970's, not sure how much that technology is changed). If you try them and they seem unusually dim, try a different bulb before giving up on the fixture..
Can’t say enough about this fixture, it is stunning!! I have a large bedroom with high ceiling so I was worried about ordering online but this exceeded my expectations! For the price, this lamp exceeded my expectations. I was drooling over one very similar in a store for *** , so I'm VERY happy to have found this. As other users have said, it's more of a cream colour than white, but if you're okay with that, you should order it. Nothing bad to say here. Beading is heavy and high quality. Love the chandy, bulbs too bright. Perfect addition to eclectic coastal bedroom. The bulbs are excessively bright though. Looks exactly like pictures. Beautiful light , great price. 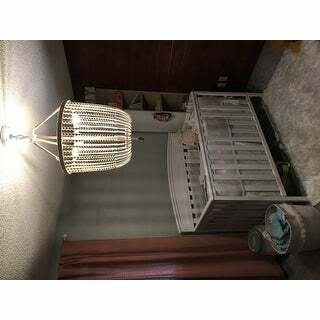 I have been looking for a beaded chandelier but they have all been $1,000+. Bought this for my dining area. The beads look a little cheap, they are plastic and far apart. Would be nicer if they where matte instead of shiny. Not sure if I'll keep it. It is also quite large. 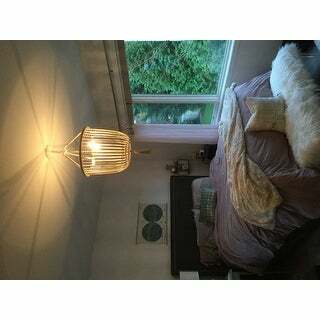 Tracked this item down after seeing in a design blogger's master bedroom. 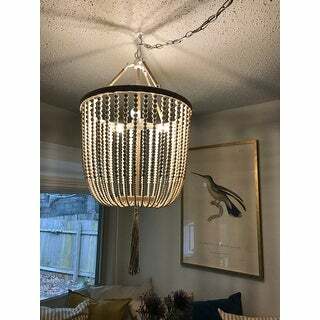 It adds something different and a great alternative to a more standard chandelier. Recommend! Love this light! I just had it installed in my guest room and it looks awesome. It gives off a good amount of light and the quality is really good for the price. I'd recommend! This chandelier was perfect for our dining. So beautiful. 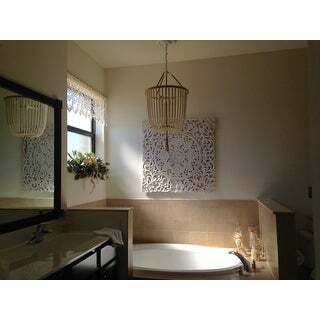 I love the look of the pendant in my bathroom. The tassel could be a little larger to make more of an impact but it is priced great and makes a nice statement in my new bath!! 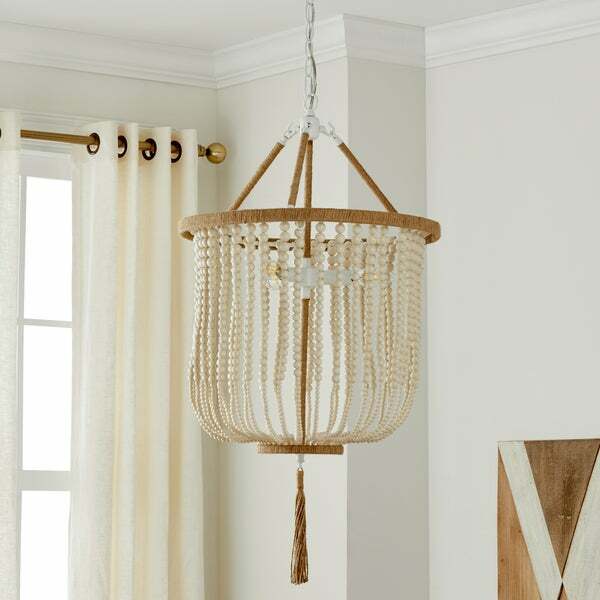 I’ve had my eye on a large wooden-bead chandelier from PB for years, but couldn’t bring myself to spend so much. When this arrived, I was so pleasantly surprised. It sure isn’t wooden beads, but once hanging, the plastic doesn’t read cheaply. It’s got presence in a space, and delivered the look for 1/7th of the price. I’m a fan! "I’m planning on ordering another one but it looks like new pics were added. The first 2 pics is slightly different, I just want to make sure it looks like pic 3 before ordering another. The jute circle at the bottom on mine is inside the beading and the heading droops differently... pic 3 is much better and I just want to make sure that’s the one I’d get when ordering. Thanks! " The room shots are the most accurate depiction of what the item will look like. I hope it helps. "Can you use dimmable bulbs in this fixture?" Incandescent bulb will work with a dimmer switch. "What is maximum bulb wattage"
40 watt, but there are 3 of them so it makes the room bright. "how much "chain" comes with this? to get it centered I need to hook the chain to a loop but wasnt sure how long the chain was. Is it very hard to install? Thanks!" The chain has a maximum length of 72”. It should not be hard to install. 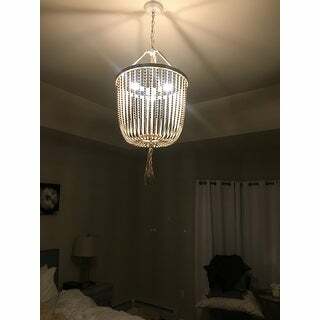 It looked similar to a much more expensive chandelier i had been eyeing on another site. I love the coastal look and the beads. "Can you give me the dimensions of this. I think the listings H might be wrong." The lamp is 18 inches wide x 18 inches deep and has a minimum hanging height of 35.5 inches and a maximum hanging height of 107.5 inches. I just installed this the other day and yes, the dimensions listed are misleading. When it says 18" wide by 18" deep that means the circle around is 18" across not that the fixture is 18" tall. It's the 35.5" minimum hang height that is important. The closest you can get this to the ceiling is 35.5" from the bottom of the fixture. I was shocked at how large it was as I installed it in my daughters bedroom but I really do love it and so does she. "What are dimensions of beaded pendant? What are the beads made of? Thank you"
The pendant is 35.5 inches high x 18 inches in diameter. The beads are made of acrylic.